Quick and simple story lines with alternating slapstick and deadpan humor. Like Chitose Get You!, animated in that static style that seems to imitate the stillness of manga. This is especially effective in emphasizing the physical, slapstick humor. And the characters are quirky but cute, cram school students hoping to make university (or at least pay the rent!). Yurumates3Dei didn't strike me as outstanding in any ( positive or negative ) way but it was entertaining enough to keep me watching. 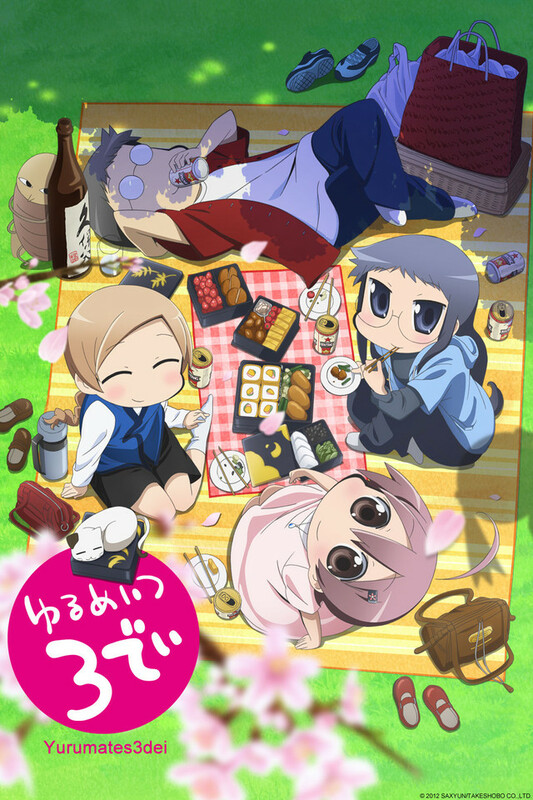 The series focuses on the antics of four adults trying to become college students with an additional character joining the cast in the middle of the series. It took me longer than I liked to appreciate the animation style but the vocals felt appropriate from the beginning. This series wasn't a bad way to spend a little over an hour ( 26 episodes running three minutes each ) and I don't think it'll be one I'll watch again but I imagine I could have come across worse via random referral. At less then three minutes the show impressively manages to concoct a limited storyline and slam through a few sketches before closing up. None of the humor can be considered top-rate but the rapid delivery ensures there's no dead zones for failed delivery to leave a bad taste. It's aware of its limitations but manages to be charming, deliver a few chuckles, and even flirt with the surreal on occasion. The 3-5 minute short seems to be in vogue. Generic characters run wild. Yurumates is another short, generic, but funny addition to the S-o-L niche. Very amusing, Well voiced. Enjoyable. "Soft" lines and pastels. Not a stinker but not memorable. Maybe 3.25 stars.